Leonard E. Lefever age 65, of Polk, passed away Tuesday, October 18, 2016 at University Hospital Samaritan Medical Center. He was born in Oberlin, Ohio on September 19, 1951, the son of Cecil and Opal (Mawhorr) Lefever. Mr. Lefever had been a resident of Ashland County all of his life. He was a 1969 graduate of Mapleton High School and later attended Carpentry School. Mr. Lefever had been employed with the Ohio Department of Transportation for 32 years before retiring. He was a member of the Polk Am Vets for over 40 years. 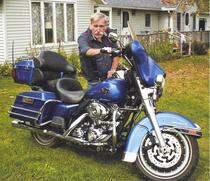 He enjoyed riding his Harley, doing carpentry work and mowing his yard. On September 21, 1983 Leonard married Janet (Bishop) Lefever who survives. Also surviving are his daughter, Ashley Lefever of Medina; sons, Jackson Lefever of Polk, Cecil “Michael” and Jenny Lefever of Zanesville; sister, Carol Wheeler of Ashland; brother, Jim and Linda Lefever of Alabama; along with his grandchildren, Tyler, Beau, Marie, Jamie, Aiden and Michael. He was preceded in death by his parents. There will be a Celebration of Leonard's Life at the Polk Am Vets on Sunday, October 30, 2016 from 3 to 6:00 P.M. Heyl Funeral Home is assisting the family with arrangements. Memorial contributions may be made to Janet Lefever for medical expenses C/O Heyl funeral Home 227 Broad St. Ashland, Ohio 44805.